In this workshop you will learn how to create a modern floral pattern sewing an embroidery hoop. Includes how to prep your hoop, prepare a design, basic stitches and how to finish your artwork ready for display. 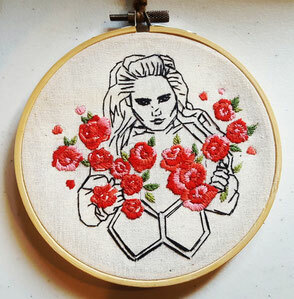 Take home your very own mini sewn hoop artwork and leave with your creativity sparked and new found embroidery skills. 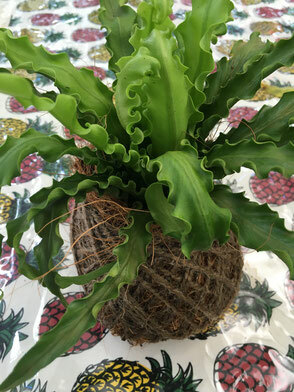 Join Pita to create your very own unique Kokedama using a 'Koke Kit'. At the end of the session there will be a bonus - make a rope holder to hang your creation. Workshop is on at Affogato Gelato & Coffee Eumundi in the courtyard at the back. 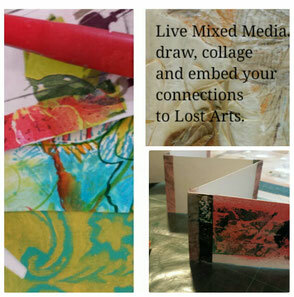 Involves layering, collaging and reinventing ways to manipulate fragments and images inspired by the Lost Arts exhibition to then create small artists books and textured canvas boards. Develop skills and techniques in confidence building activities to encourage fun ways of learning in a relaxed positive atmosphere. Learn the age old technique of string making and its traditional uses. 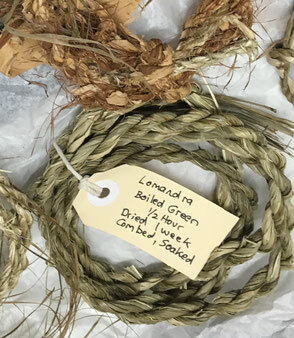 You will learn about different plants and materials that can be used to make string, from plant fibre. Cost $45 per person, $35 concession includes all materials. 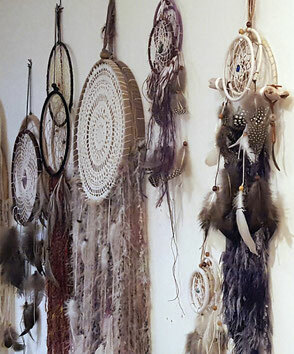 Learn how to create a Bohemian Dreamcatcher. Includes how to prep your hoop, execute a basic web, decorate and finish your Dreamcatcher ready to hang. Leave with your creativity sparked and new found skills that you can use to produce gifts and home decorations.